And now it will be a while before we deal with the Princess again. Hey, Skärva had that room decorated for you, Veronika. He tried. He really just assumed you like pink because you’re a princess. If we ever have the princess in the comic for an extended period of time, she has got to be wearing a less complicated outfit. And NO CROWN. Sigh. …Except for Mr. Floyd, who is a pretty cool dude. I wonder how Mr. Floyd would feel if he knew that he was THE EXCEPTION? Oh, he knows. Ecta is the only person who won’t let him do completely what he wants, and even she has to yield to his style and let his gorgeous blonde hair show itself. It might just be because she’s kinda bad at telling Lurkins apart and she needs to know which one to yell at. LOL the ghost with the old-person as a child is very clever. I love the Princess’s bird. Does he have a name and I’m just forgetting it, or will that be revealed later? Veronika is the only one who knows his name, and the only one whom he speaks to. Little does she know that he has an entirely different use of the same trick! The clawed-up pictures of Blank are a nice touch. Yeah, they were fun. They’re for target practice. Derking around. He went off to make sure everything is going according to plan, and will probably get sidetracked by goofing off with some children. I’m loving panel two for lots of reasons. 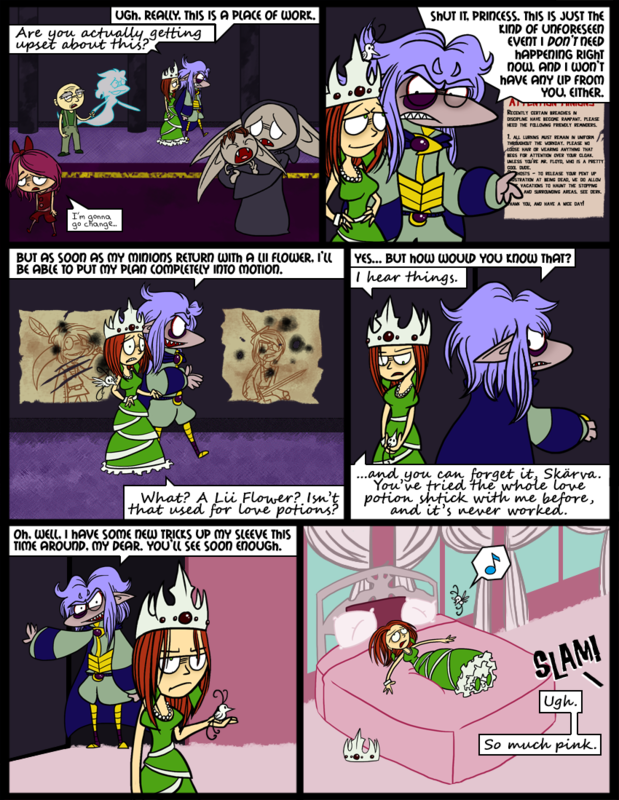 Mainly because I get a kick out of Skaerva making such a big deal of this, and of the princess finding him just as amusing. Yeah I’m a fan now. And that poster had me laughing. Floyd is awesome. Sad that the Princess won’t be around for a bit. She’s rather intelligent, from what little we’ve seen. Hmm… I think that it might be interesting to see a relationship develop between Skärva and the princess – they seem to have some similarities of outlook, in tone, at least. That second panel gives me some hope too – I think that that’s the first smile that we’ve seen her give. I really like the posters in the second and third panels, by the way – they’re amusing and add both visual interest and some minor details. Which minion type attacks with slashes, by the way? The lurkins seem to use magic, the ghosts are presumably intangible, and I didn’t see claws on the flishes. On the art side, I do notice two things: first, that the crown on the carpet seems to be drawn from the wrong perspective – it looks as though we should see it from slightly above, rather than directly from the front – and the princess’s breasts seem to point out to the sides more than I might expect. Yeah, his passions amuse her. They have a lot in common, but also a lot that differs. For all he has failed again and again, and for all he is mean and cynical and bitter, Skärva is still one of endless hope and confidence and tenacity; he tries and tries and tries again. Veronika… has given up on a lot of things already, having made little effort. Skärva is emotional – the smallest things can send him into rage or megalomaniacal glee; Veronika is a lot harder to move. We’ll see where they go. Flish can slice repeatedly with their fins (Slice? Hmmm). The burn spots are obviously magic blasts from Lurkins. The kind of attacks ghosts can do aren’t much use on posters. THAUMY! Why are you paying so much attention to the princess’s breasts, huh? I’ll work on them. Ok. Thaumaturge: officially not interested in breasts. Wait, no, that’s not what I said! I do like breasts! Interpret that in a good way! A good way!